The Lapa gold deposit contains reserves of 2.4 Mt at 6.5 g/t Au and is one of the few deposits located directly within the Cadillac–Larder Lake Fault Zone (CLLFZ), a first-order crustal-scale fault that separates the Archean Abitibi Subprovince from the Pontiac Subprovince to the south. Gold mineralization is predominantly hosted in highly strained and altered, upper greenschist–lower amphibolite facies mafic to ultramafic rocks of the Piché Group. Auriferous ore zones consist of finely disseminated auriferous arsenopyrite–pyrrhotite ± pyrite and native gold disseminated in biotite- and carbonate-altered wall rocks. Native gold, which is also present in quartz ± dolomite–calcite veinlets, is locally associated with Sb-bearing minerals, especially at depth ≤1 km from surface where the deposit is characterized by a Au–Sb–As association. At vertical depth greater than 1 km, gold is associated with arsenopyrite and pyrrhotite (Au–As association). 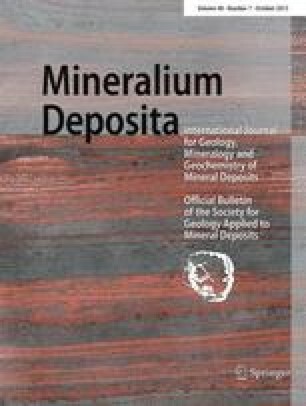 The mineralogy and paragenesis of the Lapa deposit metamorphosed ore and alteration assemblages record the superposition of three metamorphic episodes (M1, M2, and M3) and three gold mineralizing events. Spatial association between biotitized wall rocks and auriferous arsenopyrite indicates that arsenopyrite precipitation is concomitant with potassic alteration. The predominant Au–As association recognized across the deposit is related to gold in solid solution in arsenopyrite as part of a pre-M2 low-grade auriferous hydrothermal event. However, the occurrence of hornblende + oligoclase porphyroblasts overprinting the biotite alteration, and the presence of porous clusters and porphyroblasts of arsenopyrite with native gold and pyrrhotite indicate an auriferous metasomatic event associated with peak M2 prograde metamorphism. Late retrograde metamorphism (M3) overprints the hornblende–oligoclase M2 assemblage within the host rocks proximal to ore by an actinolite–albite assemblage by precipitation of free gold and Sb–sulfosalts at lower P–T. The complex relationships between ore, structural features, and metamorphic assemblages at Lapa are related to the tectonometamorphic evolution of the Cadillac–Larder Lake Fault Zone at different times and crustal levels, and varying heat and fluid flow regimes. The Lapa deposit demonstrates that early, low-grade gold mineralization within the Cadillac–Larder Lake Fault Zone has benefited from late gold enrichment(s) during prograde and retrograde metamorphism, suggesting that multi-stage processes may be important to form gold-rich orogenic deposits in first order crustal-scale structures. The online version of this article (doi: 10.1007/s00126-013-0466-3) contains supplementary material, which is available to authorized users. The authors wish to express their sincere appreciation to Agnico-Eagle Mines Ltd. and the Lapa mine geology department staff for financial and logistical support and for the authorization to publish. We are especially grateful to Jocelyn Coté, Normand Bédard, and Guy Gosselin for their invaluable assistance and helpful discussions about the deposit. We acknowledge the Natural Sciences and Engineering Research Council of Canada for scholarships to M. Simard and a Discovery grant. An earlier version of the manuscript was substantially improved by comments and suggestions from an anonymous reviewer, S.G. Hagemann and G. Beaudoin.